Home» AP TS LATEST JOB's » BHEL Engineer Trainee Job Recruitment Notification - 2016 Total 200 Posts. 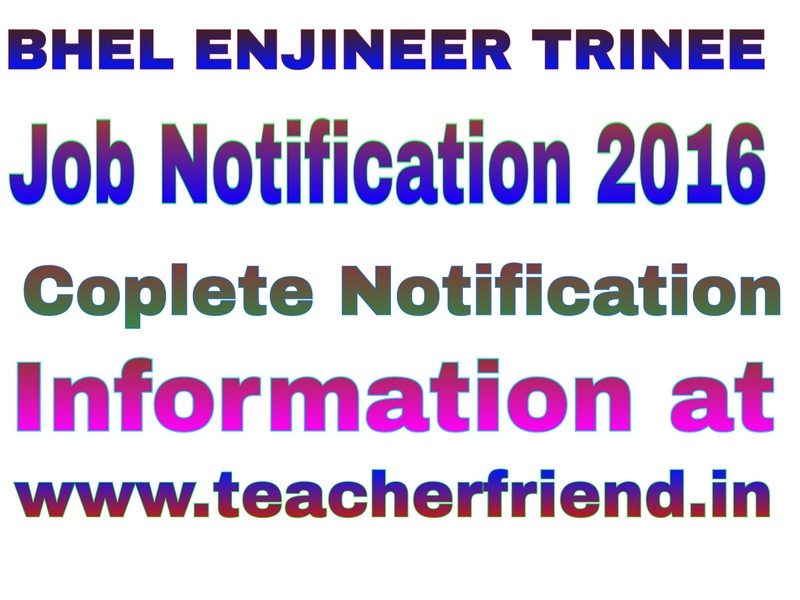 BHEL Engineer Trainee Job Recruitment Notification - 2016 Total 200 Posts. BHEL Engineer Trainee Job Recruitment Notification - 2016 Total 200 Posts Notification Online Application. regional offices and project sites spread all over India. The company has its footprint in more than 70 countries all over the world and has achieved a net profit of Rs 1314 Crores and turnover of Rs 30806 Crores in 2014-15. BHEL offers a challenging and rewarding career to young and dynamic graduates in the disciplines of Mechanical, Electrical, Electronics and Metallurgical Engineering to contribute towards Nation building in the fields of Power, Industry, Transmission, Transportation and Non-conventional Energy. 1. Candidates should be able to furnish their Final Year Mark sheets at the time of Interview. 2. Candidates presently employed in Central/ State Government, Autonomous bodies, PSUs may apply through 'Proper channel' or submit 'No Objection Certificate' at the time of interview from their employer, if they are invited for interview. 3. Furnishing of wrong / false information will be a disqualification & BHEL will not be responsible for any consequence of furnishing of such wrong / false information. Candidature is liable to berejected at any stage during the recruitment process or after recruitment or joining if any information provided by the candidate is found to be false or candidate is not fulfilling the eligibility criteria mentioned in the advertisement. 4. The admission of candidates at all stages of selection process will be provisional and is subject to satisfying the prescribed eligibility conditions. Mere issue of unique acknowledgement number / Interview call letter to the candidate will not imply that his/her candidature has been finally cleared by BHEL. BHEL takes up verification of eligibility conditions with reference to original documents only once the candidate has been invited for interview. 5. Candidates are advised to possess a valid e-mail ID, which is to be entered in the on-line Application Form. They are also advised to retain this e-mail ID active for atleast one year as any important intimation to the candidates shall be provided by BHEL through e-mail. They are further requested to check regularly their e-mail for any communication from BHEL in this regard. 6. BHEL recruitment website http://careers.bhel.in/ will provide necessary details regarding, how toapply / important dates / Interview call letters etc. The responsibility of downloading and printing of Interview call letter shall be that of the candidate. No separate Interview call letters shall be sent to the candidate by post. Candidates are advised to visit the website http://careers.bhel.in regularly for updates.